Waterbury Clock Co., "Calendar No. 40", ca 1891. What you see is all very nice. The clock runs beautifully, strikes a rich sounding gong on the half hours. What you don't see are the missing top, the calendar movement, and the calendar dial. 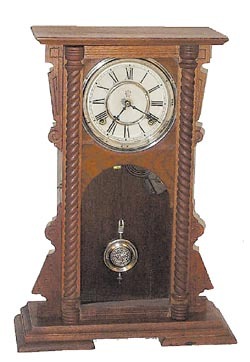 This is a fine 20 inch walnut case with rope columns on the door, nickel pendulum and dial rings. You can hardly tell there was ever a calendar movement in the case. It has the look now of a regular mantle clock. There is half of one label, and 75% of a second label. Ly-Waterbury No.263.